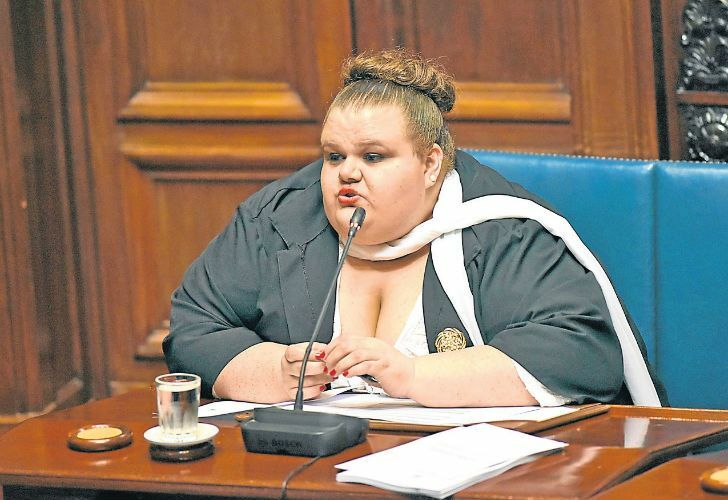 Uruguayan Senator Michelle Suárez speaks during a Senate session, in Montevideo on Tuesday. Michelle Suárez became Uruguay’s first transgender senator this week, vowing to use her position to expand and protect the rights of transgender people in the small Latin American country. The 34-year-old lawmaker representing the Communist Party, part of the ruling Broad Front (Frente Amplio) coalition, assumed her seat in the upper chamber of Congress, where she intends to push for a law that would let transgender people change their legal identities without having to get a judge’s approval. It would also mandate that one percent of government jobs be reserved for transgender people and establish a pension to compensate transgender people who were persecuted during Uruguay’s 1973-1985 military dictatorship. “Uruguay has evolved, but it’s still a discriminatory country,” Suárez said in an interview. Previously, as an activist, she helped draft a bill that legalised gay marriage when it became law in 2013. In an interview, Suárez said she was 15 when she acknowledged that she was a woman living in a male body. She added that her parents have always been supportive, but some classmates and teachers discriminated against her growing up. Nevertheless Suárez finished high school with top grades. Life became somewhat easier when she moved from her small seaside hometown to the capital, Montevideo. But even there a college professor who specialised in human rights refused to grade her work because of who she was, Suárez said. Suárez later became the first transgender person to earn a university law degree in the country of 3.3 million people. In 2009 she began working as an activist for gender rights as a way to cope with her mother’s death. The milestone for Uruguay comes amid some other gains for transgender rights in a region where macho attitudes are still prevalent and resistance to LGBTQ issues can often be fierce. In 2012, Argentina allowed people to change their legal and physical gender identity without having to undergo judicial, psychiatric and medical procedures. Earlier this year the country appointed its first transgender police chief. In Chile the government has been pushing an array of measures for gender rights including greater acceptance for transgender people in general and children in particular.